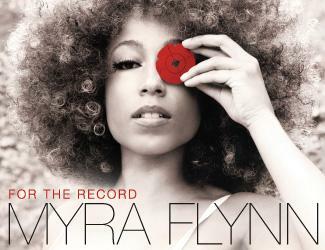 Burlington, Vermont’s Myra Flynn is a testament to the new music industry. With fierce independence she embraces (and frankly, attacks) not only the role of singer/songwriter, but also of manager, promoter and marketing director. The results of her relentless drive can be seen in full effect when her new album, For The Record, which drops in early August. For The Record finds Flynn revisiting the folk-meet-soul territory of her 2009 debut, Crooked Measures, but with a self-assured sense of commitment and what seems like another lifetime of reasons to sing. Her vocal influences have as much in common with Ani Difranco and Shawn Colvin as they do with Rihanna and Jill Scott. Emergency appears early on the record and finds Flynn mining her poppier sensibilities. It’s a wonderful piano rocker that pulls out all the stops—bringing in the full-band treatment and layering crunchy vocal effects into the production for a track that could easily find its way onto the playlist of a forward thinking independent radio station. Title track For The Record is a beautiful, soulful piano ballad and realist’s view of love. “Love isn’t joy/Love isn’t pain/Love just takes time.” Adding to the intimacy of the track is its tinkling, music box intro which breaks out into a tear jerking account of relationships in the real world—complete with arguments that no one wins and the tedious yet surprisingly tender moments of a day-to-day, month-to-month, year-to-year relationship with a soul-mate. The double-dutch jump-rope chant of Say So is entertainingly incongruous given the song’s subject matter—a kiss off to a shallow lover. The song breaks out into a full-on indie rock jam before returning to its playground melody at the end. What’s truly wonderful about Flynn is her desire to pursue her dreams her own way. With her vocal and songwriting chops she could easily churn out Top 40 R&B hits. She insists instead on delivering her unique and uncategorizable brand of indie-folk-soul-R&B, making her maybe slightly less marketable but certainly far more entertaining. When Flynn hits the big times it will be on her own terms—that’s for sure.